While requirements vary by country, it is not uncommon for Apostilles, legalizations, certified translations, and notarized translations to be requested from foreign nationals during their application processes. Please see below for more information regarding these requirements. Q1: What is an Apostille? A1: An Apostille is a certificate that authenticates the origin of a public document (e.g., a birth certificate, a certificate of marriage, academic diplomas issued by public institutions). Apostille requirements vary by country. Q2: When may I use an Apostille? A2: Apostilles are only valid if both the country where the document was issued and the country where the public document is to be used are both parties to the Hague Convention. For more information about which countries are parties to the Convention, click here. 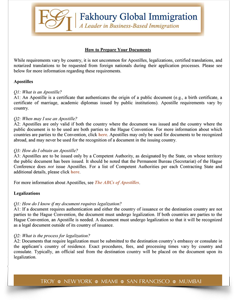 Apostilles may only be used for documents to be recognized abroad, and may never be used for the recognition of a document in the issuing country. Q3: How do I obtain an Apostille? A3: Apostilles are to be issued only by a Competent Authority, as designated by the State, on whose territory the public document has been issued. It should be noted that the Permanent Bureau (Secretariat) of the Hague Conference does not issue Apostilles. For a list of Competent Authorities per each Contracting State and additional details, please click here. For more information about Apostilles, see The ABCs of Apostilles. Q1: How do I know if my document requires legalization? A1: If a document requires authentication and either the country of issuance or the destination country are not parties to the Hague Convention, the document must undergo legalization. If both countries are parties to the Hague Convention, an Apostille is needed. A document must undergo legalization so that it will be recognized as a legal document outside of its country of issuance. Q2: What is the process for legalization? A2: Documents that require legalization must be submitted to the destination country’s embassy or consulate in the applicant’s country of residence. Exact procedures, fees, and processing times vary by country and consulate. Typically, an official seal from the destination country will be placed on the document upon its legalization. Q1: What are certified translations? A1: Certified translations typically consist of the original text, the translated text, and a signed statement (an affidavit) from the translator and/or translation company that attests that the translation was prepared by a skilled translator and is a complete and accurate representation of the original text. For more information about certified translations in the United States, click here. Q2: What are notarized translations and how do they differ from certified translations? A2: Notarized translations differ from certified translations as they require the translator to swear in front of the notary that the translation is a true representation of the original. It should be noted that the notarization of a translation does not necessarily assess the quality of the translation, but rather only creates a legal record with the translator’s attestation that the translation was produced in good faith and according to professional translation standards. For more information regarding the differences between certified and notarized translations, click here.